Kangana speaks on Women Empowerment ! Once in a while, I take a break from being a Maa and attend media events. I was recently invited to an event which was sparkled by the presence of Kangana Ranaut. She looked pretty and radiant in her no makeup look and her copper flared gown, styled by Ami Patel. 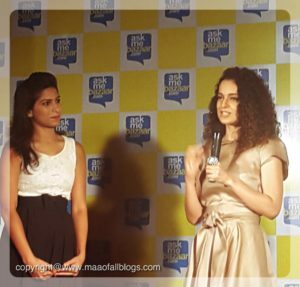 She was there to felicitate twenty winners of ‘Meet and greet Kangana’ contest, from all over India. 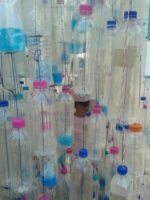 A contest that was organised by AskmeBazaar. Women are associated with being sensitive, emotional ,dainty like a flower. Just because you are a man doesn’t mean you can’t be sensitive? A woman doesn’t need to be treated like a Goddess! This is a very superficial approach. She has been ridiculed many a times for her diction. With this she made a statement, you dont need a hold on the language to have a beautiful mind. Kangana is one of the most dependable and talented actors in Bollywood who has a huge fan following. Through this contest we want to infuse a bit of fun and excitement for our online shoppers & followers on our social platforms and add more benefits to our sellers and service providers. You might as what is AskmeBazaar? It is an online portal where consumers can buy, bargain, compare, order door delivery and do cash payment for goods of their choice. What did I take back from the event ?A quirky picture of Maa ,lol ;)!! Can you guess the missing word? We will keep you updated on interesting byte like this, when I come across one ! Happy Reading :)! disclaimer:To support the blog sometimes we ,at the ‘Maa’ team attend events.Don’t hold it against us :). Revival of ‘The Saree’ !! « IPL Fever-If Brands got Innovative ! !